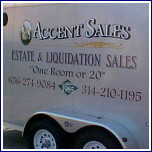 Our History: in 1983 we were operating an antique shop and a friend asked us to do an estate sale. From there we did another and a total of three our first year. Over the following few years we conducted from three to five sales a year. Quickly the business increased and we were conducting a sale a month and now we have escalated to 38 sales. The majority of our clients find us through referrals although we placed our first yellow page ad in 1995. Our method is unique we believe the sale should be an easy as possible experience for the client completed with feeling and understanding. The shopper's experience should be pleasant as well with items clearly marked and set up in an easy flow manner. It also has to be more than just a job for us. Visit one of our sales or call us.